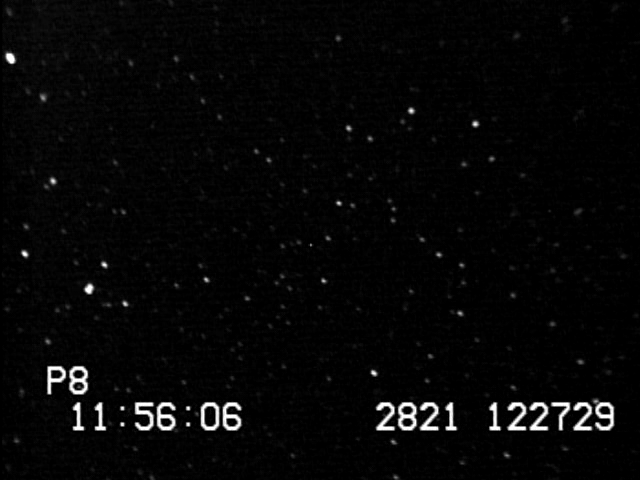 Pluto will occult P130504 on 2013 May 04 (middle of the night on Friday). 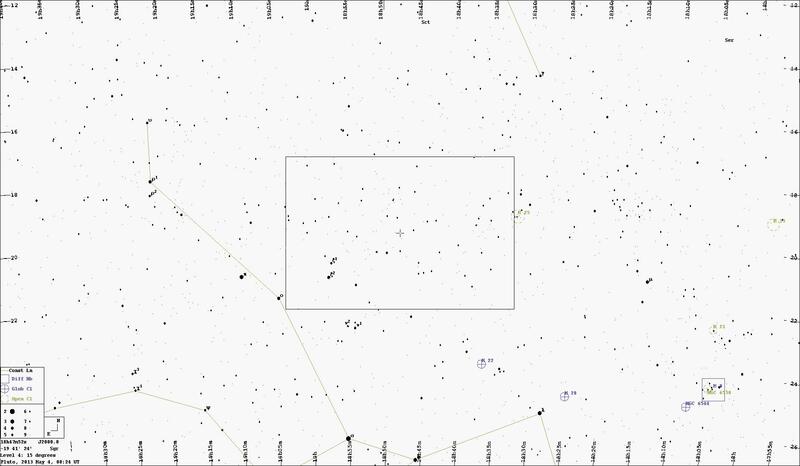 The star has an R magnitude of 14.4, similar in brightness to Pluto. That’s pretty faint for our systems but tests indicate this will work just fine for us. Use senseup=64 for this event. 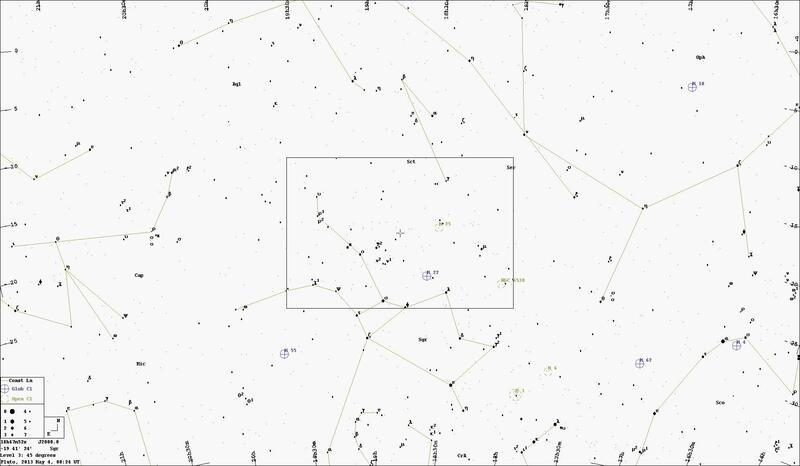 The J2000 star position is ra=18:47:52.5, dec= -19:41:24. 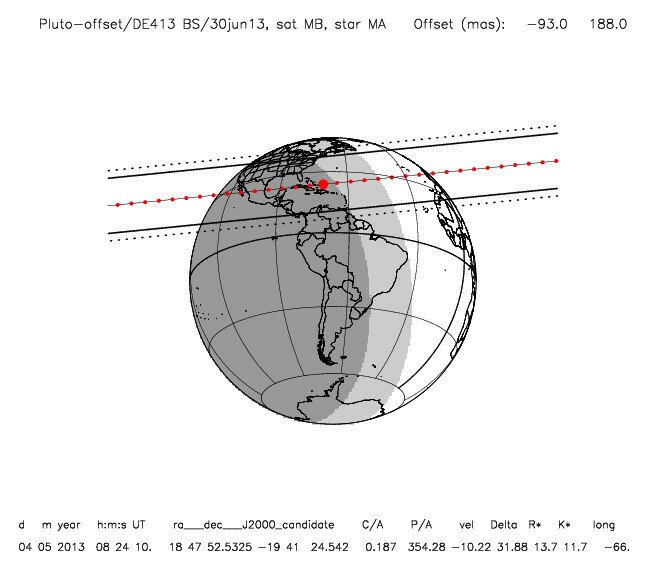 All sites should record data from 08:17-08:37 UT. This range of time includes baseline observations before and after the event plus extra padding for variations in the current predictions. Make sure to set your video segment size to 30 minutes or longer. When done, upload your data and logsheets. This is our first official RECON campaign! Significant other scientific resources are being committed to this event, and Pluto is a great opportunity for RECON to both contribute to the science as well as test out logistics on attempting a Kuiper Belt Object. below the horizon for everyone. All positions are J2000. Note that the default star for Precise GoTo is Nunki. During setup just before observing the field, the stars Antares, Vega, and Deneb make a good set for the Auto-Align. Switch to the camera while on Antares and focus and then move on to the field. Note that when using Precise GoTo Nunki is the first choice of hop star. On event night Nunki may be unreachable before the event. Kaus Borealis is an alternate star for Nunki. 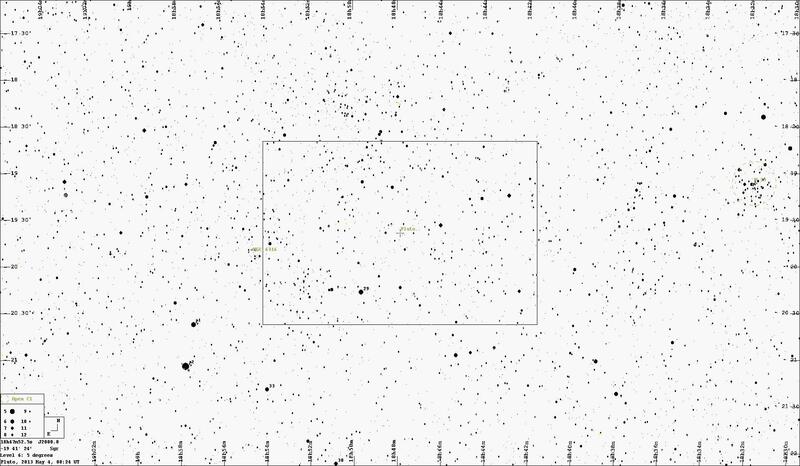 This image was taken on 2013 Apr 12 UT with our standard setup. Sense-up was set to x64. 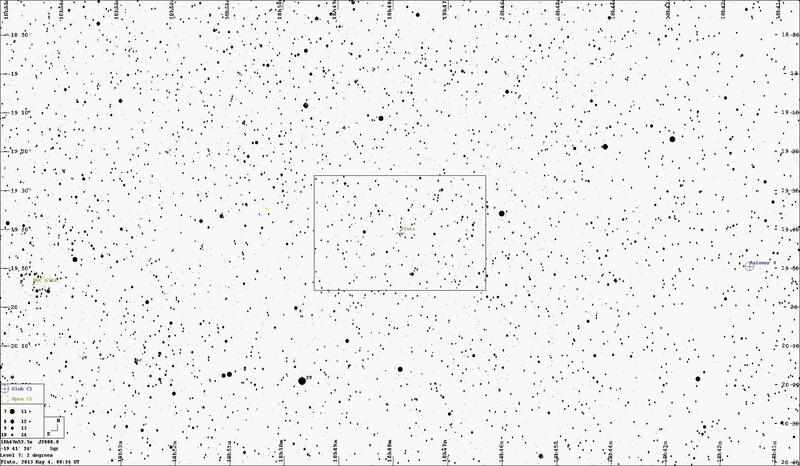 The top image is processed to bring out the fainter stars (including the star to be occulted). The target star is indicated by the two red ticks. 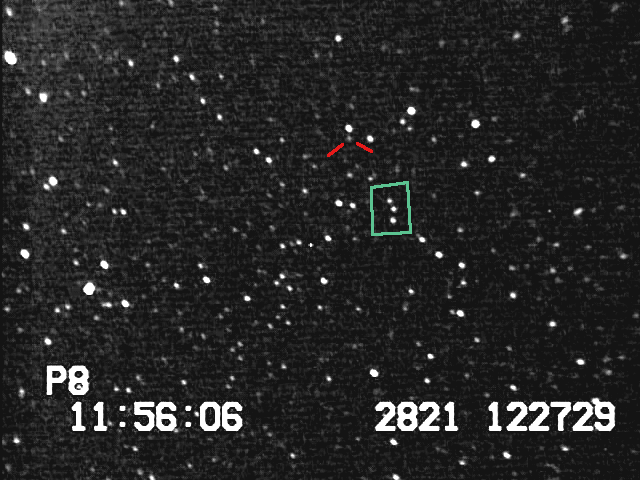 Note the three stars highlighted in the rectangle. 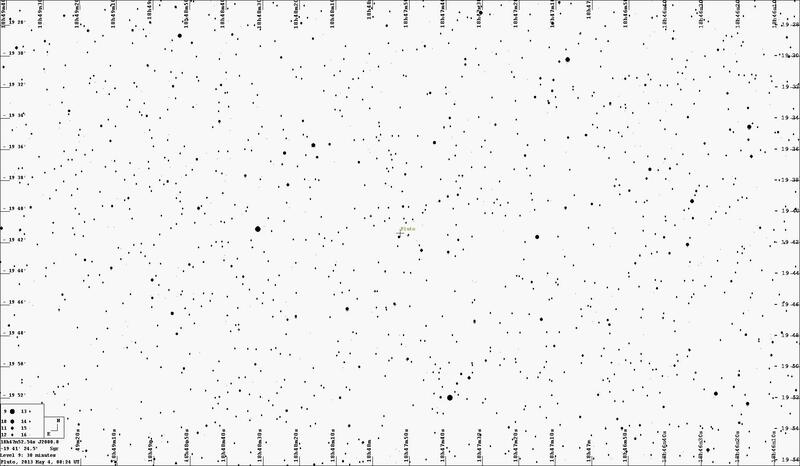 This pattern is quite easy to spot and lets you recognize the field without having to find the actual star. Annotated and enhanced image of the occultation star. This is not what the field will look like in the DVR screen. For reference, the original image as you will see it is shown below without annotation. Note that the triplet shows up clearly. Original image at sense-up x64 of the occultation star. This event is being pursued by three professional groups, Southwest Research Institute, Observatoire de Meudon, and MIT. The links take you to each group’s public page. At this point all three groups agree on prediction over South America. However, the uncertainty is still large. The MIT prediction would indicate that we still have a 10% chance of seeing the event from the RECON sites. Note that there are other large telescopes planning to observe this event from the USA just in case it comes our way.